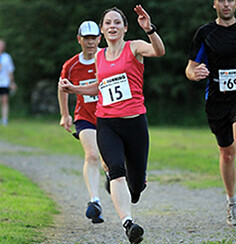 Dreaming of Footpaths: Women's Running Magazine ... And ME!!! 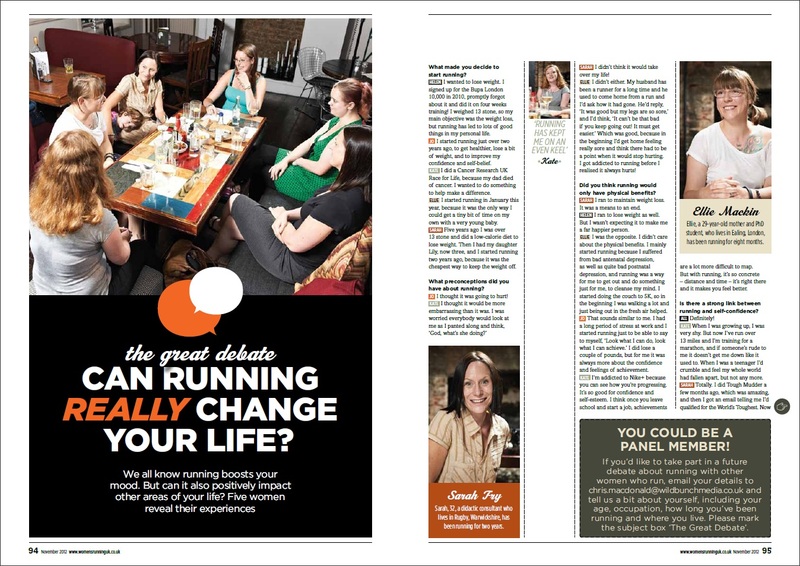 Women's Running Magazine ... And ME!!! I’ve received the – long awaited - November issue of Women’s Running Magazine through the post! We all sound so fab and I love the article! So excited and can’t believe that I’m in a glossy mag! About running! And I don’t even sound like the Karl Pilkington of the running world! And no ... I can’t stop the exclamation marks! However, I do wish I had time to put some makeup on and at least brush my hair. We thought we’d have at least 15 minutes to faff around beforehand, but no – it was a crazy dash through central London trailing a baby and a toddler both of which needed toilet stops and feeding at random moments. Meh. Guess what? 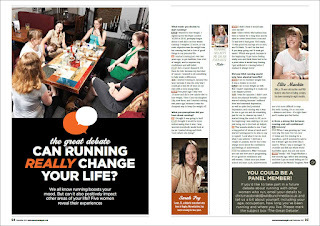 I’M IN A MAGAZINE ABOUT RUNNING! Note to self. Stop doing 'crazy eyes' in photos. It makes me look like I’m on drugs. Or slightly crazy. Or something. Although, I have to admit there was some awesome photobombing from the toddler. She seems to have inherited her mother’s ‘crazy eyes’. Autumn Running ... weather for?